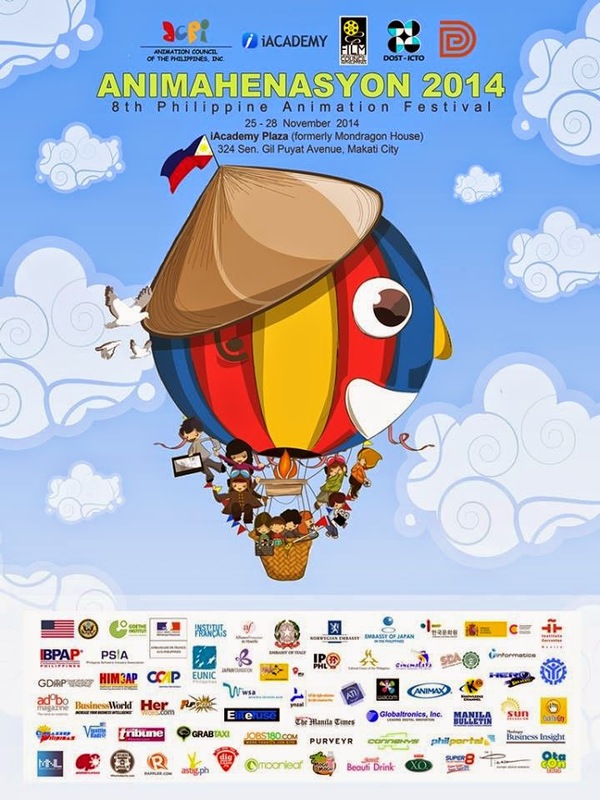 The Animation Council of the Philippines, Inc. (ACPI) puts together its flagship project through an annual animation festival called Animahenasyon. 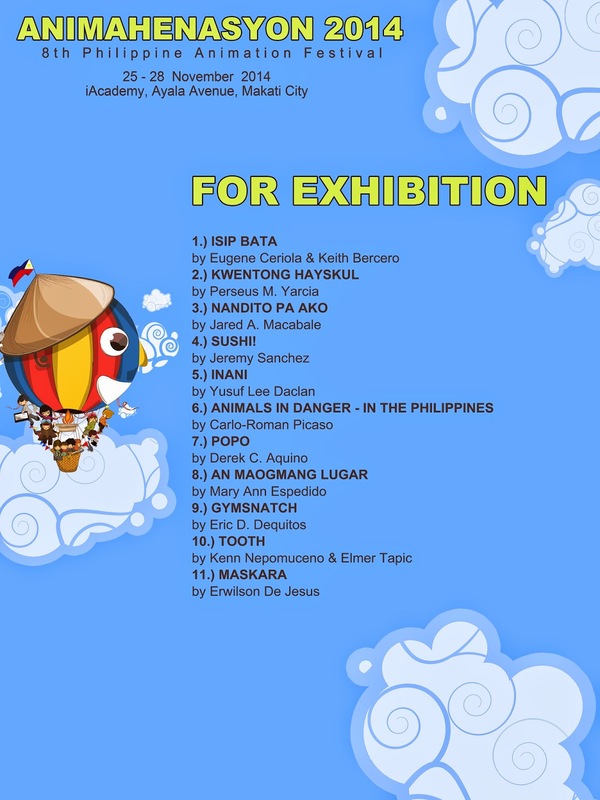 This showcases original animated works of both aspiring and professional animators in the country through a competition. 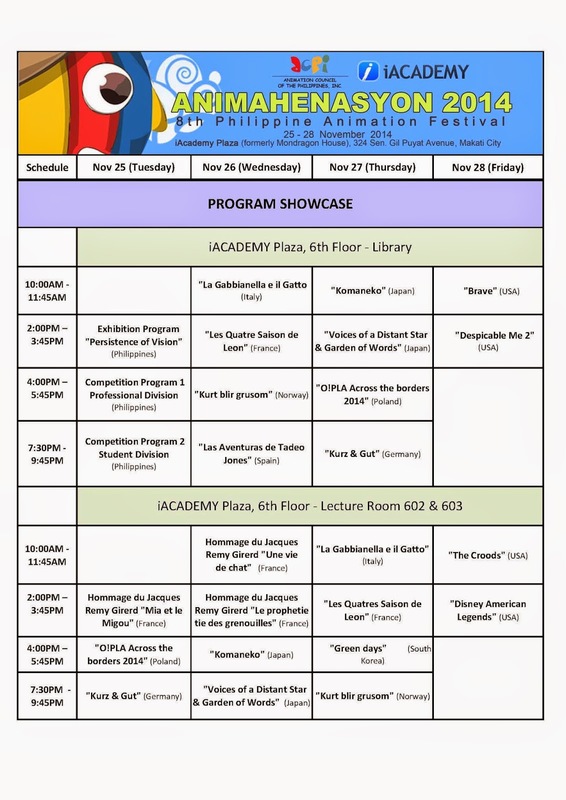 On its 8th year, Animahenasyon Philippine Animation Festival will be held from November 25-28, 2014 in iACADEMY’s newly owned building campus located at 324 Sen. Gil Puyat Ave., Brgy. Bel-air, Makati City. Animahenasyon aims to give further progress to the growth of Philippine animation industry and its contributions to the global animation, and development of original Filipino content. The festival is composed of a competition, animated film screenings and animation conference. 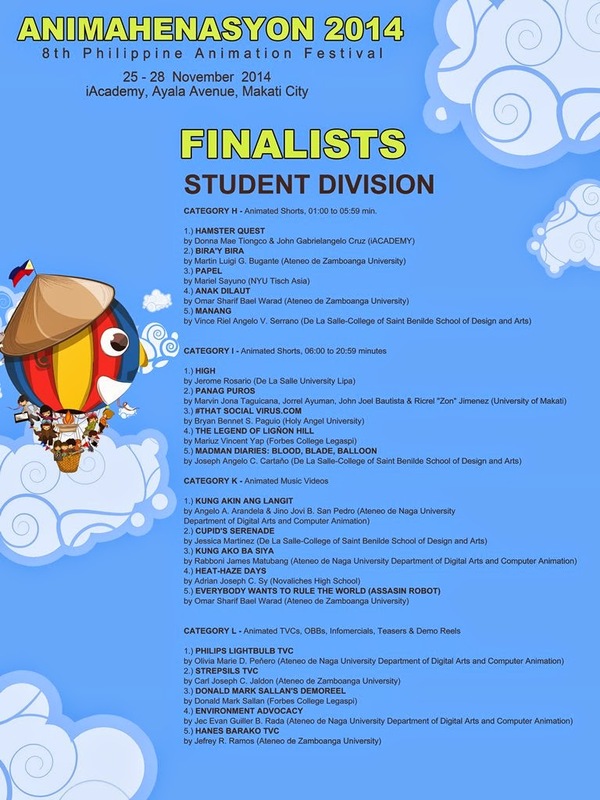 The festival competition is divided into the professional and the student divisions that will have different running time categories. There are categories for music video, title sequence, public information, demo reel, and TV series. Special screenings of animation flicks from different countries will also be shown during the festival. The animation conference is separated into three: (1) plenary sessions with well-established international speakers in the field of animation from France, South Korea and Malaysia; (2) breakout sessions that addresses certain topics in relation to the animation industry (intellectual property, education, business and production) and (3) master classes / workshops that aim to introduce the different software techniques and equipment used for animation. 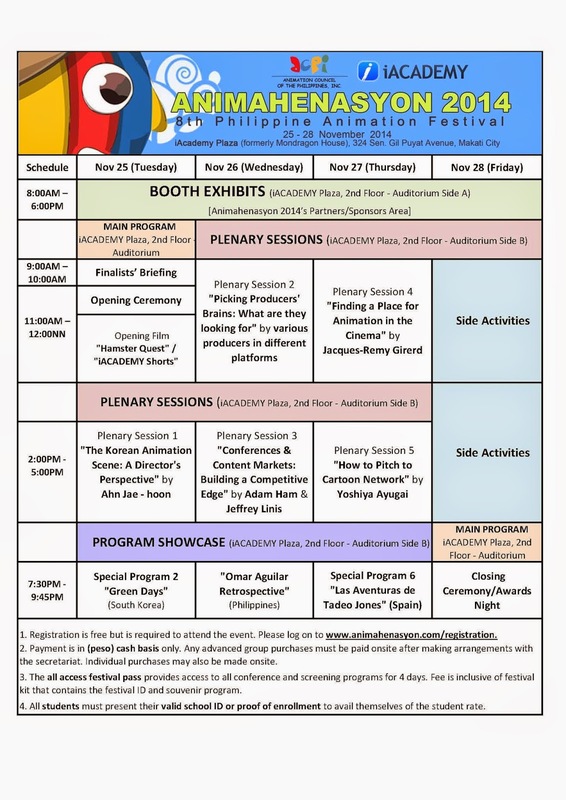 Animahenasyon Philippine Animation Festival has become a venue to access locally produced animation content for promotion in animation markets here and abroad to showcase the talent of the Filipinos. It encourages potential talents to explore the many career opportunities available in the industry and hone their skills through its competition, and provide a venue for exchange among animators, producers, industry supporters, investors, stakeholders and other possible business networking, and matching opportunities. 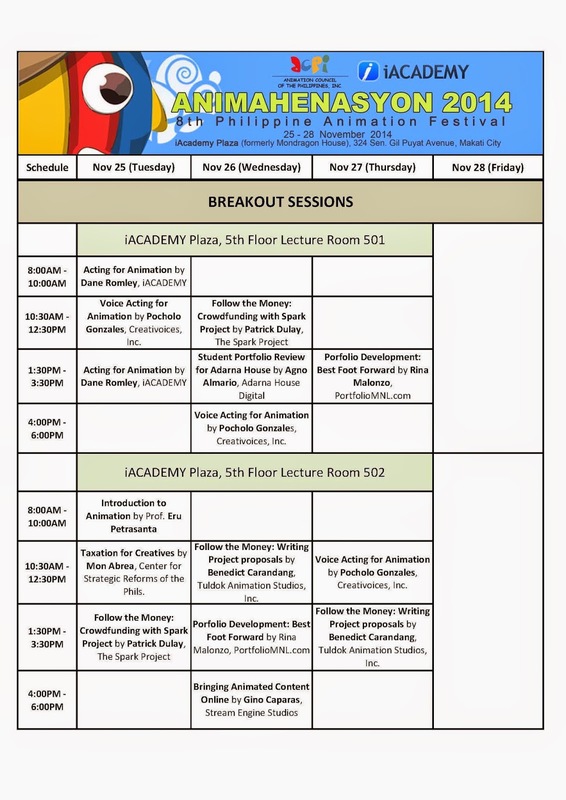 It also addresses issues & concerns, discuss and set direction for the development of the Philippine animation industry through the festival’s conference. Selected animated films from France, Germany, Italy, Japan, Norway, Poland, Spain, South Korea, and United States of America among others will also be showcased. The embassies of some of these countries are also bringing in speakers for the conference, making this year’s international participation the biggest in Animahenasyon’s history. 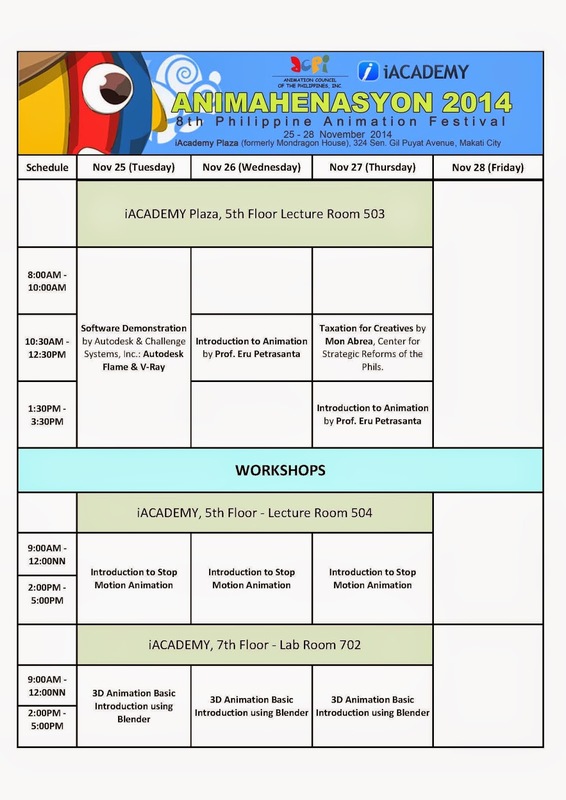 This prestigious event serves as a venue for Filipino animators to present their world-class ideas, and opens doors of opportunities for them to meet with and be inspired by the finest names in the industry. It also aims to create greater awareness of the Philippine animation industry and its contributions to the global entertainment business, while tapping locally produced content for promotion in animation markets here and abroad. As an organized body, ACPI aims to be central to the growth of the Philippine animation community and to nurture our passion for animation. ACPI is a non-stock and non-profit organization whose member companies and schools specialize in traditional 2D, digital 2D and 3D animation. It also offers animation trainings and courses. 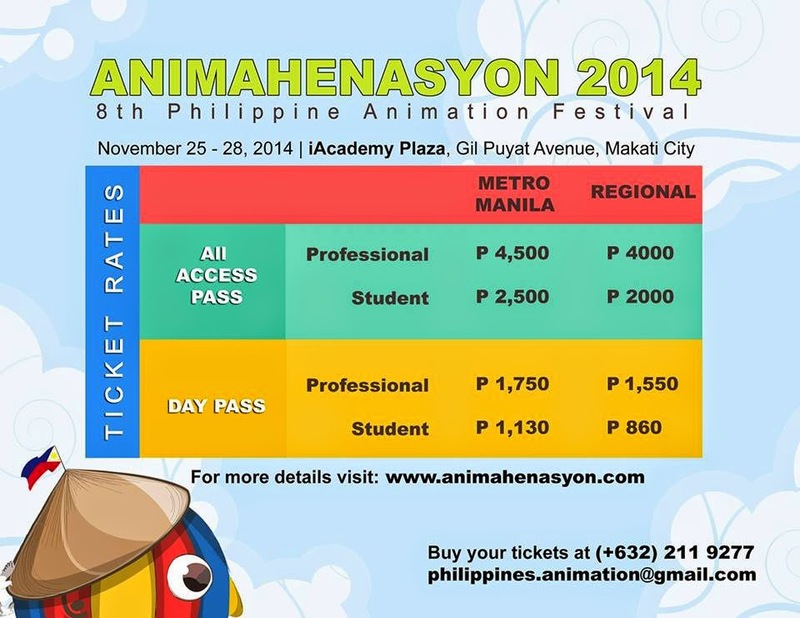 You may call (632) 817-2727 local 108 or email the secretariat at animahenasyon.marketing@gmail.com. 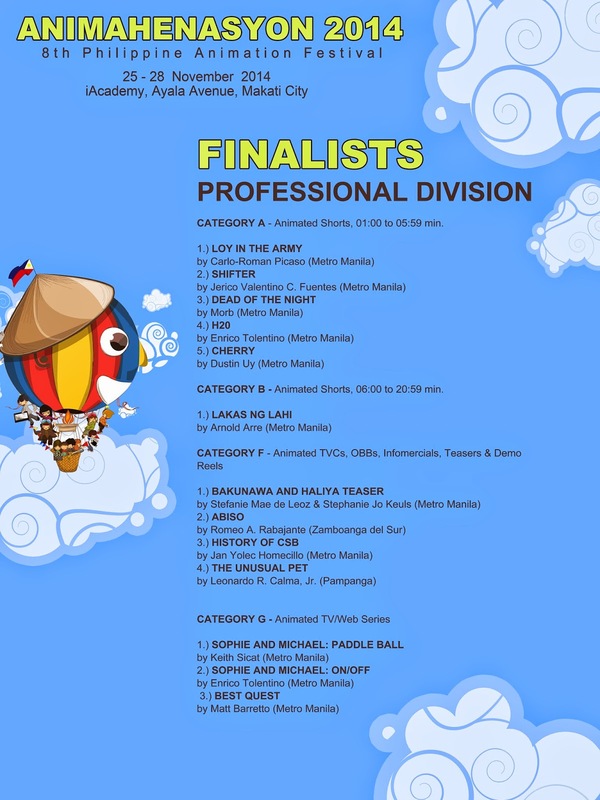 A special program of 7 animated short films featuring: HAMSTER QUEST, AMITIE, TAMANARAW, ASTRAL, 10:01, EXPECTANCE, & STAND UP. Director: Romeo A. Rabajante, Jr.
Director: Leonardo R. Calma, Jr.
HOW TO CREATE A STREAM ENGINE STUDIOS VIDEO! Director: Roberto J. Oquias, Jr.
Omar P. Aguilar is this year’s recipient of THE OUTSTANDING EMERGING ARTIST IN ANIMATION AWARD. This program is a showcase of some of his animation works from 2004 to 2013. O!PLA ACROSS THE BORDERS 2014 is an exceptional program that include the winners of 2nd O!PLA – THE FESTIVAL OF POLISH ANIMATION – the fully independent cultural project, whom edition 2014 was held in 44 Polish cities, from march 21st to June 8th 2014, and in which only the audience decide about the winners! This films break the routine while teaching German. They have reality shows with the jealous Hippos and lovelorn Rhinos in KEIN PLATZ FÜR GEROLD. One encounters mysterious Chest that throw the humans off balance in BALANCE. One is anxious about the Cat, as he puts his nine lives on the line for his love in KATER. One learns the history of mankind from the perspective of the speaking stones in DAS RAD and can witness live, the deadly courtship dance of the unbridled water shrews in OUR WONDERFUL NATURE. The animated short film can take phrases literally, it can ‘turn heads’ and ‘break hearts’ in LIEBESKRANK. It will take the viewer into nirvana in UNSER MANN IM NIRWANA and present to us the individual in a shy young man in ANNIE & BOO or an ugly, vicious Troll and Child thief in DER WECHSELBALG. Finally, the animated film can change the world in DELIVERY and the sons show that they are ready to go to the end of the earth for the most important woman in their lives in URS. Studio Folimage, founded by Jacques-Rémy Girerd in 1981, specializes in the direction and production of films, placing young authors at the core of its concern.